Posted on March 6th, 2019 in At large. Another lumpy but surfable morning on tap. Sets at stand out spots should be delivering shoulder plusses, but while the wind was light northerly as I wrote this, the conditions are not going to be great. According to the MHL buoy the 1.8 metre, 11-sec swell was coming mainly from the SE, but there’s definitely some longer period NE component in the mix as well. I’d expect it to be more chaotic than clean. Beachwatch posted a algal bloom warning yesterday, so depending on how the wind and swell affected it, there could still be problematic stuff in the water. I’d be taking a pretty close look before jumping in. The light wind of the early session will give way to a 20-25 kt southerly this afternoon which will then dominate through to tomorrow morning. Swell’s supposed to come up with it, but you may want to wait until tomorrow afternoon when the NEr is due and possibly (depending on how short the period is) some interesting stuff could show in protected, southerly friendly north corners (not that there are many of those to choose from). Santa Barbara has no waves to speak of today and by this afternoon another couple days of solid rain is due to arrive – so even if the swell comes up, the water will be horrible. All of this is academic where I’m concerned because tomorrow evening I’ll be on the 15 hour haul back home to Sydney. Hooray! A slow-moving high pressure system over the Tasman Sea is extending a ridge towards the northern New South Wales coast, directing east to northeasterly winds. Winds in the central and southern parts of the coast are fresh to strong northerlies ahead of a cold front and associated strong and gusty southerly change, which is expected to cross the southern and central parts of the coast during Wednesday, then northern parts on Thursday. Northerly 15 to 25 knots shifting southerly 20 to 25 knots in the early afternoon. Winds reaching up to 30 knots early in the morning and again in the evening. Northeasterly 1.5 metres inshore, increasing to 1.5 to 2 metres offshore. Partly cloudy. 80% chance of showers. The chance of a thunderstorm during this afternoon and evening. South to southeasterly 15 to 25 knots, reaching up to 30 knots early in the morning. Winds turning east to northeasterly 10 to 15 knots in the evening. 2 to 3 metres, decreasing to 1.5 to 2 metres during the morning, then decreasing to 1 metre around midday. Posted on March 5th, 2019 in At large. It looks to be shoulder plus on sets at various places around the Northern Beaches this morning, unfortunately as anyone who’s looked outside knows, the wind was 10+ kts from the NE by first light as it heads to peak speeds this afternoon in the 25-30 kt range. Wind swell is 2 plus metres out at sea, but the period is mostly around the 6-second mark, so catching waves will be a real challenge – even if you don’t mind the blasting onshores. Tomorrow’s set to be more of the same and then on Thursday it’s due to go southerly – hard. Not the best outlook sad to say. After a brief barely surfable pulse late last week, Santa Barbara is back to unseasonable microness as per the pic below of Campus Point earlier this morning. Looks like the next pulse will fill in around the time my plane leaves LA on Wednesday. Typical. Tell you what though, I’m really looking forward to Sydney’s warm water again. Forecast issued at 4:10 am EDT on Tuesday 5 March 2019. A slow-moving high pressure system over the Tasman Sea is extending a ridge towards the northern New South Wales coast, directing east to northeasterly winds. Winds freshen and tend northerly today ahead of a cold front and associated strong and gusty southerly change, which is expected to cross the southern and central parts of the coast during Wednesday, then northern parts on Thursday. North to northeasterly 20 to 25 knots, reaching up to 30 knots in the evening. Easterly 1.5 metres, tending northeasterly 1 to 1.5 metres by early evening. Northerly 15 to 25 knots, reaching up to 30 knots at times during the day. Winds shifting southerly 20 to 25 knots in the middle of the day. Easterly 1 to 1.5 metres, tending northeasterly 1.5 metres during the morning. Southerly 20 to 25 knots turning east to southeasterly below 10 knots during the afternoon. Southerly below 0.5 metres, increasing to 1.5 to 2 metres during the morning. Easterly 1 to 2 metres, decreasing below 1 metre during the afternoon. Posted on March 2nd, 2019 in At large. Looks like a messy but surfable day at most of Sydney’s beaches. Not amazing quality, but water’s warm and there are even a few shoulder high faces (briefly) to be had at better exposures. Swell at 0800 on the MHL buoy was showing 1.3 metres at 10 seconds mainly from the SE. Wind’s going around to the NE soon. Looks as though there should be fun ones again tomorrow am and with luck you’ll have options on Monday and Tuesday am as well. I finally got in the water here today with a mate at a little spot west of Goleta that was picking up knee to waist plus glassy things. Fun on a long board although the water was around 15, so after awhile the 3/2 couldn’t keep me warm enough. Still, just the two of us, so that’s good. Tide was very low too. A slow-moving high pressure system over the Tasman Sea is extending a ridge towards the northern New South Wales coast. This pattern is expected to persist into next week, bringing east to northeasterly winds over the northern half of the coast, and north to northeasterly winds over the southern half of the coast. Winds in the south will freshen during the weekend as a cold front passes to the south. Northeasterly 15 to 20 knots, reaching up to 25 knots offshore in the late evening. Partly cloudy. 50% chance of showers in the morning and early afternoon. The chance of a thunderstorm in the morning. Posted on March 1st, 2019 in At large. Looks like a partly cloudy start to the day in Sydney with knee to waist and a bit bumps coming in for the morning session. Swell’s about a metre from the east at 9 seconds apart, so we’re not talking heaps of power. But with something appropriate under foot, I’d say fun could be had in that 24C water. Tide’s coming off the high and is currently dropping to the midday low. Wind’s light NW for the early session but will gradually settle around to the NE as the day warms to 27. Chad and Jeremy? 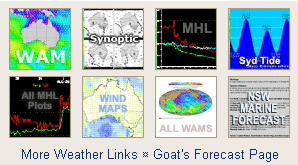 The Goat’s quirky sense of humor is on display in this week’s surf outlook, which, I have to say sounds pretty fun. I’m particularly liking the final line about the further outlook as I shall be back to RealSurf HQ by next Friday. In the meantime, my prospects for catching a wave here in Cali are not looking overly hopeful. As you can see from the Surfline postcards, the only place to be is 4 hours away down the coast today. I can’t believe that in 5 weeks at the end of winter there hasn’t been one quality day of surf within driving range of my location. Oh well, getting skunked is part of the surfing experience, so I remain philosophical – and looking forward to the warm water of home. Forecast issued at 4:10 am EDT on Friday 1 March 2019. A slow-moving high pressure system over the Tasman Sea is extending a ridge towards the northern New South Wales coast. This pattern is expected to persist into next week, bringing east to northeasterly winds over the northern half of the coast, and north to northeasterly winds over the southern half of the coast, freshening during the weekend. East to northeasterly about 10 knots increasing to 10 to 15 knots in the afternoon. Partly cloudy. 60% chance of showers. The chance of a thunderstorm.